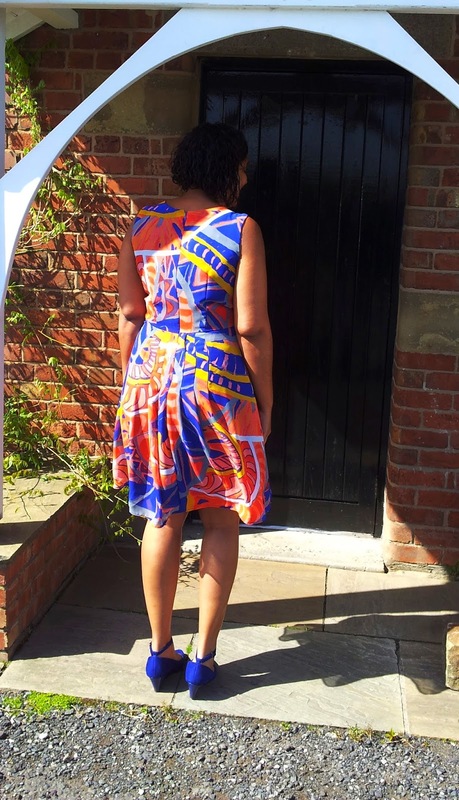 I do enjoy the opportunity of sewing a wedding guest dress. 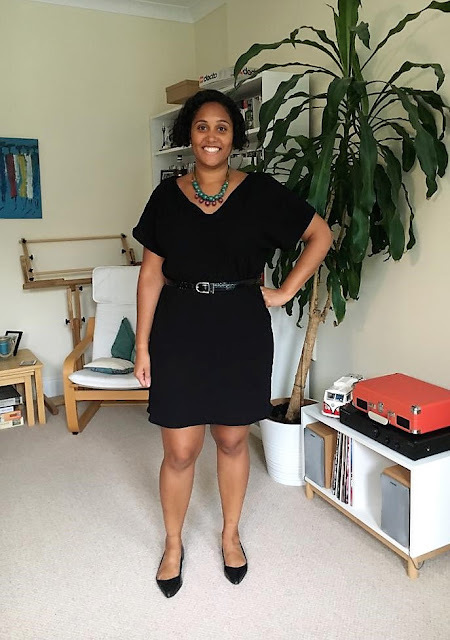 It's a great chance to sew something a little bit special and challenge myself to pick something out of my comfort zone. Two of my uni friends got tied the knot this weekend and I went with Vogue 1223. 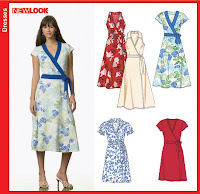 This is a dress pattern where both the fabric and the pattern design steal the show equally. I love how the left hand bodice extends into the majority of the skirt. It's a really interesting design feature. 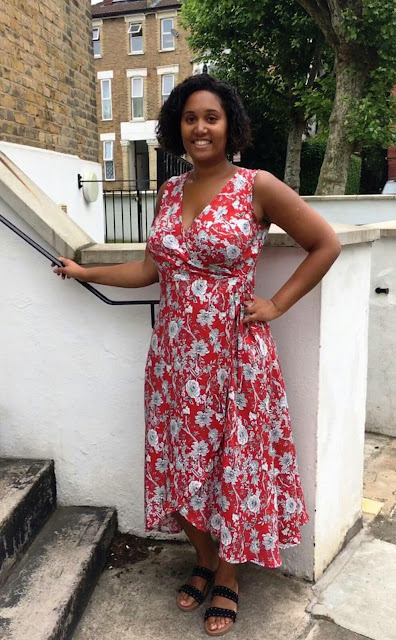 I have to say that I spent a really long time popping in tailor tacks and basting darts - I got through a good half a season of CSI whilst sewing this dress. Here is a close-up of the dress front. you can see a bit more clearly how the pleats extend all the way down the front of the bodice into the skirt. 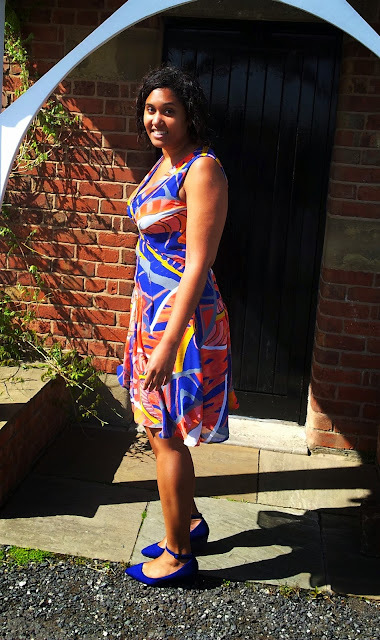 The fabric is a polyester chiffon purchased from the fabric stall on Market Row in Brixton Market. It was an absolute steal at £2.20 per metre. I lined the dress with georgette from Simply Fabrics (also in Brixton) priced at £1.50 per metre. The chiffon was not too bad to work with at all. I used a new needle and decreased the pressure on my presser foot and everything worked fine. I really took my time sewing this as no one wants to be unpicking chiffon. Also, just for the record I purchased the fabric as it's such a fun print, but mostly because I instantly knew that it would be a perfect match for my blue shoes! I tested the fit by making the lining first. 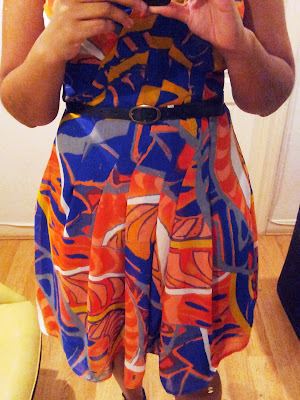 The lining pieces are very different to the dress, but it gave me an idea of the overall fit. I made very minimal fit adjustments. I took out 1.5" at the top of the centre back going down to 0" at the waistline. I hemmed this using a pin hem rather than following the instructions in the pattern. I found the instructions very well written and all of the markings and lines matched up. The only thing that made me scratch my head slightly was when attaching the lining to the front of the dress and breaking the stitching at the point of the V. I am not sure that I did this correctly as it took a lot of trimming and pressing to get it to lie vaguely flat. I love the colours in this dress and absolutely adore the feminine lines in the pattern. 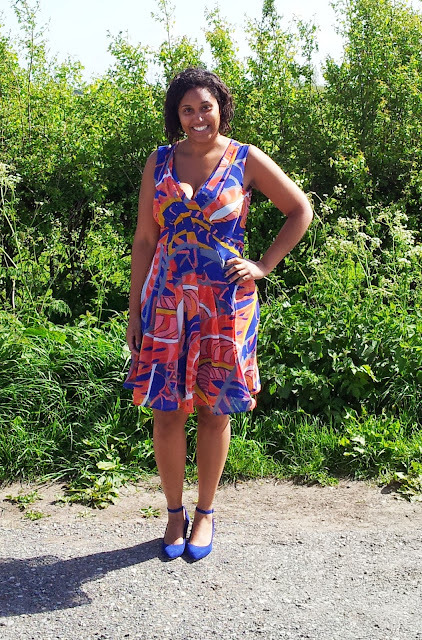 This dress also ticks the box as my May Garment of the Month and its great that I have tackled another designer pattern in my stash. That makes 2 designer patterns so far this year, which is great! You can view my review on Pattern Review here. Anyone have a favourite designer for patterns? I love this colour fabric on you. And it surely matches your shoes. Love the pleating as well. I have always tried to avoid chiffon but after reading your post, perhaps I will try it again! I love this dress, it is gorgeous! Such great colours and beautiful design. But my gosh, this is chiffon? I am totally in awe! The V-neck thing sounds intriguing, In wonder if this would be done similarly in a man's tie? Only the other way round. This is really beautiful. Love the pleats! Your styling looks great. This is the perfect fabric for this beautiful fabric. I know you felt so proud and pretty at that wedding. A Girl Just Can't Have Enough!